Tiger Is Great Again ... just as Trump predicted. 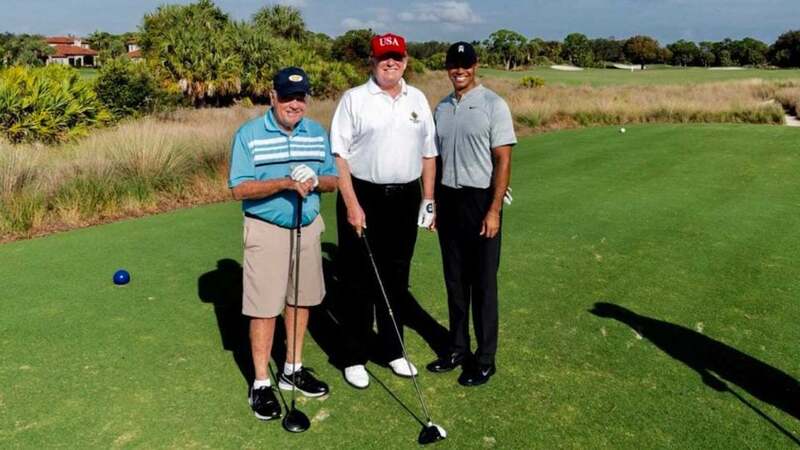 President Donald Trump played golf with legends Tiger Woods and Jack Nicklaus on Saturday at Trump National Golf Club in Jupiter, Fla., even tweeting a picture with the 32-time major winners. But who won the match? Well, according to the president's follow-up tweet on Sunday, whomever was paired with Woods must have fared pretty well. "Everyone is asking how Tiger played yesterday," he tweeted. "The answer is Great! He was long, straight & putted fantastically well. He shot a 64. Tiger is back & will be winning Majors again!"